RALEIGH, N.C. (AP) -The Minnesota Wild aren't scoring many goals these days, so Matt Cullen gave the Carolina Hurricanes all the offense they'd need. Cullen had a goal and an assist to lead the surging Hurricanes past the Wild 3-2 on Thursday night in a matchup of division leaders. Erik Cole scored the go-ahead goal on a deflection midway through the second period, Scott Walker also scored and Joe Corvo had two assists for Southeast Division-leading Carolina. "To respond the way we did and kind of grind out an ugly one, a playoff-style hockey game, was big," Cullen said. "And those are games we have to win. To be able to play the way we did and hang on to the lead ... I thought (Carolina) carried the play for the most part of the game. It was a great game by us and one that we needed." The Hurricanes have won three straight and six of seven, improved to 9-2-1 since Feb. 12 and opened up a five-point lead over idle Washington in the division. They never trailed, but allowed an early 2-0 lead to evaporate before Cole redirected Cullen's slap shot on a power play. That goal "was really big, especially due to the fact that we had to respond from the last one where we gave up the lead," Cullen said. "In general, that third goal of the game is so big, and to come on the power play and get it like that, that was really big for us." Pavol Demitra and Mikko Koivu scored to rally the Wild from their early two-goal deficit, but they still were held to three or fewer for the ninth straight game. They entered with the league's ninth-best power play, but went 0-for-6 against the NHL's worst penalty killers. Minnesota hasn't scored a power-play in three games. "We tried everyone," coach Jacques Lemaire said. "I got tired of trying the same guys all the time. So I put the checkers in and they did the exact same thing - no goal." Josh Harding turned aside 25 shots for Minnesota, which remained tied with idle Calgary atop the Northwest Division despite losing its second straight since a three-game winning streak. "The urgency has to be there right now," right wing Brian Rolston said. "We're right in the thick of things. We have to realize that. I thought we have. I thought we battled hard. We made a couple of mistakes but we have to come out harder at the start of the game." Cam Ward made nine of his 26 saves in a chippy, scoreless third period for the Hurricanes, who managed just two shots in the final 20 minutes. The teams combined to draw 14 penalties in the third, including game misconducts six minutes in for Walker and Minnesota's Keith Carney after a melee broke out when Aaron Voros boarded Carolina All-Star Eric Staal. "That's what happens when a whole bunch of your guys end up out of the lineup with penalties, but we hung in there," Staal said "Obviously, Cam played tremendous the whole night, and down the stretch, you need goaltending, and he was great tonight in the third period." Cole broke a 2-2 tie 30 seconds into a slashing penalty to Carney, positioning himself in front of Harding and tipping Cullen's slap shot past the Minnesota goalie. The goal originally was credited to Cullen before a third-period reversal. "It was nice that our power play was able to generate some shots, and that's made our power play successful, having that traffic in front and getting pucks back to the point and shooting it," Cole said. Cullen had given Carolina a 1-0 lead by deflecting a shot by Corvo past Harding. That snapped a streak of six straight games in which the Hurricanes allowed the first goal. "Our start obviously wasn't good because we spotted them two goals," Rolston said. "After that we played hard but we can't spot them two goals and then start playing. The thing is that we're in that hockey game." Notes: Carolina is 20-4-2 when scoring first. ... The Wild are winless in four visits to North Carolina. ... 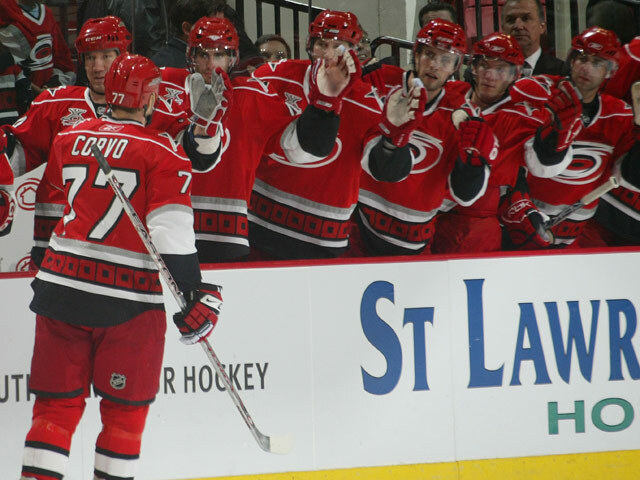 The Hurricanes have scored at least one goal with a man advantage in four straight games. ... Wild RW Marian Gabornik extended his points streak to four games by assisting on Koivu's goal.